WELCOME..to the Garden at the Gardens! We hope you enjoy your visit. and learn a lot. Scan the codes as you travel through the garden to learn more about the plants. We have several garden beds as well as herb boxes and garden bags. This years crop began in January with planting of the herb boxes and garden beds. The Garden Bags were added on March 1st. We harvested butterleaf lettuce from Bed 3 and Cabbage from Bed 4. We made a delicious cole slaw from the cabbage. YUM! 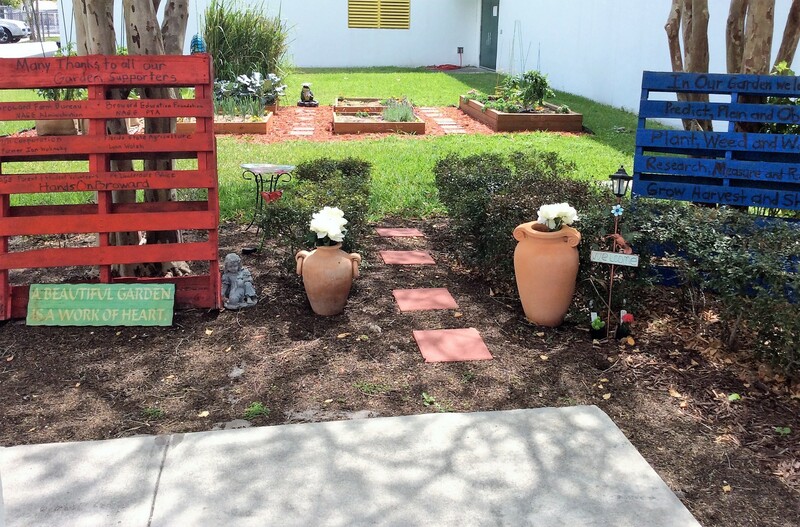 The garden began in the 2015-16 school year and has continued to develop. Second grade teacher Tara Dukanauskas wrote and received grants and support to make this garden a reality. Principal Davida J. Shacter and Interim Principal Craig Lehrhaupt. A special thanks to Mr. Pottmeyer and his student for our wall mural. A special THANK YO Uto everyone who has helped crreate and support our Garden.